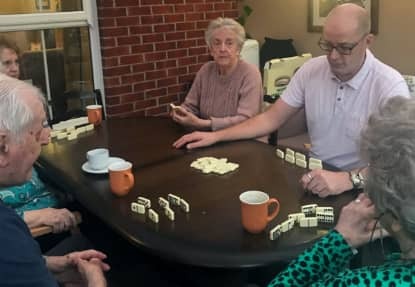 Residents at Penwortham Grange & Lodge recently had a fun filled day, with variety of different tabletop games. The day started with a friendly game of bingo, which had residents competing for the coveted box of chocolates! Bingo got everybody in the mood for a day of friendly competing, with one resident Tony, cheering every time he matched a number, which had the group in hysterics. Also in attendance was one of the resident’s sons Michael, who won the game of bingo with a full house! He generously shared his winnings of chocolate with the group. Next on the gaming agenda was a quick game of cards followed closely by quite a few games of dominoes! Michael taught the residents how to play and was such a hit; they carried on playing until the end of the day. “The residents got quite animated whilst they were playing. Lots of jokes were being told and there was a lot of conversation from around the table, it was an absolute delight to see”, commented Sue Hoyle, Activities Coordinator at Penwortham Grange & Lodge. The day was filled with so much fun and laughter, that residents are eagerly awaiting the next game sessions!